On July 11th this year, it was exactly 21 years since the Srebrenica genocide. 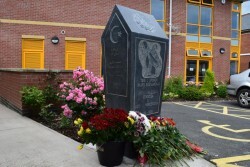 Bosnia and Herzegovina Community Association Derby marked the occasion on Sunday July 10 by holding a memorial event during which a monument dedicated to the Bosniak mother, victims and witnesses of genocide in Bosnia and Herzegovina was unveiled. Twenty-one represents a coming of age – a passage into adulthood. Thousands of Bosnian young people never had the chance to celebrate their coming of age and were systematically murdered because of who they were. The youngest victim of genocide that was buried in Potocari three years ago is a two days old baby Fatima Muhic. She was only two days when the criminals killed her. Fatima would celebrate her 21st birthday this year. We live in turbulent times. We are seeing increased levels of hatred, particularly anti-Muslim hatred, and it’s never been more important that events like these are held and that young people are involved in order to learn and send a message to others that such hatred leads to genocide. The monument, which is funded by Heritage Lottery, was officially revealed by the volunteers who helped in the overall project titled "Bosnian War People and Children Saving History, Language and Culture in East Midlands", Mayor of the City of Derby, Councillor Linda Winter and Zemka Zahirovic, mother who lost her three sons and husband and has lived in Derby for the last 20 years. It all began with the religious part. In the main part of the program, guests were firstly addressed by the chair of our association Nermina Webster who wished them a warm welcome and then Manager of the Centre, Mr. Ferid Kevri? talked about the whole project funded by Heritage Lottery including the monument. After Ferid’s speech, Ramiz Zahirovic and Emil Zahirovic-Algie read a testimony written by Sudbin Music from the village of ?arakovo near Prijedor after which Adna Bjelobrvi?, Sara and Sana Akram, Aldijana Pobri? and Amela Subasic read the poems. After a short program, guests moved outside where, with a lot of tears and emotions, official monument unveiling took place. Immediately after the unveiling of the monument, our Imam Ahmed ef. Gopo, recited a prayer and then flowers were laid, first by the Mayor of Derby, Councillor Linda Winter and then all the others who wished to do so. On this occasion we want to thank all those who have in any way contributed to this project. Special thanks goes to all those who donated food for this event that is of a very significant value for all of us.